A lightweight and comfortable fast training or racing short with some great features that are comfortable and unrestrictive. So good you don't notice them at all. Shorts are an often overlooked piece of kit but I’ve found that a pair of well fitting and comfortable shorts can really make a difference. 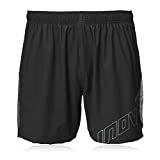 The AT/C 6 inch shorts from inov-8 are lightweight, breathable and fast and feature a supportive liner boxer and are the perfect short for fast training runs and racing. Four way stretch fabric on the short outer ensures unrestricted leg movement while the DWR coating allows rain the run straight off helping to keep you dry. An elasticated draw string allows you to tighten the shorts without putting too much pressure on your stomach. The back of the shorts feature a zipped pocket that is big enough to stash a mobile phone and keys. A mesh pockets give you space to carry a few gels should you need to. The inov-8 AT/C 6″ Shorts are really comfy when you pull them on and the length is just right for racing. I’m not a fan of really short shorts as I feel really exposed so for me these are just about perfect. When running you don’t even know you have them on which I guess for a pair of shorts is a bout as good as it gets. They allow a full range of movement and aren’t restrictive in any way. The back pocket is big enough to carry keys and essentials on a short run but anything longer and you will need some extra storage space. Now the weather is picking up I’m wearing these shorts more often and I can’t fault them. Build quality is high and they look like they will last for a while. If you are on the market for a pair of high quality and comfortable shorts for fell racing then these inov-8’s will take some beating.